The Bunga Pads Boot Bumper is a combination between the Lace Bite Pad and the Achilles' Healpad. The gels are molded inside an elastic, latex-free sleeve. The two gels reduce pressure, shock, vibration and rubbing. They protect the front and back of the foot simulatenously. 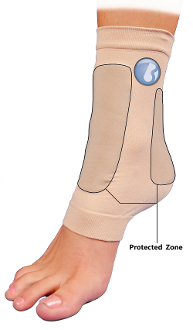 Helps protect the foot and ankle from abrasions without the added bulk. Effective in protecting against discomfort caused by ski boots, skates, cleats and other athletic footwear. Provides light compression to the foot and ankle. Can fit either right or left foot. Sold as 1 sleeve, not in a pair.